A recent national survey of Master’s Programs rated our program one of the best in the nation. 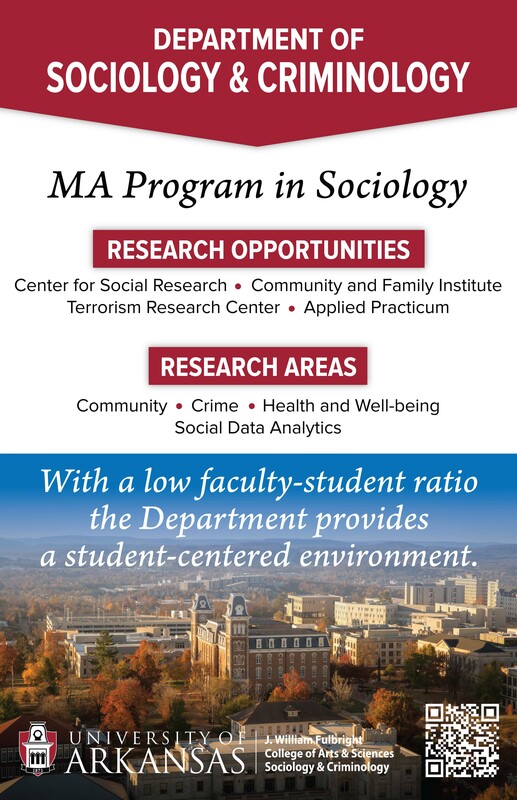 The University of Arkansas Sociology Master’s Program has an exceptionally strong graduate faculty and a student to faculty ratio of four to one, permitting more individual interaction toward attaining the student’s goal. The faculty members involved in our graduate program are very dedicated to working with our graduate students. Many of our graduate students are involved in the research projects conducted under the auspices of the Community and Family Institute (CFI) , The Terrorism Research Center, and Center for Social Research. The MA program is designed to be completed in two academic years. Our program prepares students future doctoral work in the best doctoral programs in sociology, and related disciplines, especially criminology. Our graduates have continued in doctoral programs at Duke University, the University of Maryland, University of Minnesota, University of Wisconsin at Madison, Florida State University, University of Pennsylvania, University of Oregon, among others. Our students also continue their post MA education in the interdisciplinary Public Policy Ph.D. program at the University of Arkansas and professional programs, such as law. Our graduates find employment as research specialists working for government and various NGOs, both in the United States and abroad. Many of our graduates work in the criminal justice system, community organizations, or teach at the community colleges, among many others.